Excel Dryer has been a longtime supporter of improving educational initiatives on a local, regional, national and global scale. Denis Gagnon, President and CEO, supports local educational programs including the Millbrook Scholars Program that provides inner-city Springfield, Massachusetts teens the skills to succeed in the workforce – which may even lead to opportunities for those teens to work at Excel Dryer, located in the Springfield region. Additionally, Denis serves on the board of directors of Western New England University. Denis’ son, William Gagnon and Excel Dryer’s Vice President of Marketing, has followed in his father’s footsteps by establishing a partnership with the Center for Green Schools at the U.S. Green Building Council (USGBC). The USGBC’s Green Apple program is a global cause-marketing initiative that seeks to create high performing schools that save taxpayer dollars and provide safer learning environments for children. Through this partnership, Excel Dryer has created custom covered Green Apple XLERATOR® high-speed, energy-efficient hand dryers and a portion of the proceeds go back to support Center for Green Schools programs. Excel Dryer has provided more than just an opportunity for schools to embrace sustainable facility maintenance solutions; custom covered Green Apple XLERATOR® hand dryers are available for any facility to purchase. The Center for Green School’s mission to put every student in a green school within this generation resonates with schools around the world, including the Sacramento City Unified School District, in Sacramento, California, which was one of the very first to adopt Green Apple XLERATOR® hand dryers. A customized cost-savings analysis revealed that XLERATOR® could save Sac High almost $17,000.00 annually – a 98 percent savings versus paper towels – and eliminate 5,587 pounds of paper towel waste a year. The report also evaluated key variables to address the school’s environmental concerns. The report estimated XLERATOR® hand dryers would reduce the school’s hand drying carbon footprint by just over 80 percent, which the United States Environmental Protection Agency (EPA) estimates an equivalent annual savings of 104 trees, 18.48 cubic meters in landfill space, over 123,000 gallons of water and emissions from over 116 gallons of gasoline. 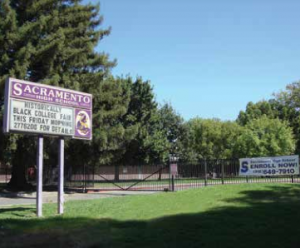 A full case study outlining the cost-savings realized by the adoption of Green Apple XLERATOR® hand dryers at the Sacramento Charter High School, and how to purchase Green Apple XLERATOR® high-speed, energy-efficient commercial hand dryers for your facility, is available at exceldryer.com/greenapple. In addition to donating a portion of the proceeds of every Green Apple XLERATOR® sold, Excel Dryer is a proud supporter of the Green Apple Day of Service. The annual event brings together thousands of advocates from around the world, including students, teachers, parents, elected officials, organizations, companies and more, by taking action in their communities through local service projects. Taking place on the last Saturday in September of each year, the Green Apple Day of Service presents an opportunity for substantial change to be made in support of healthy, sustainable schools. For more information, visit mygreenapple.org.